There have been smartphone apps created for just about everything, and fishing is no exception. Many smart fishermen are downloading the best smartphone applications on the market to assist them with their fishing trip. These apps can help you stay in good weather, receive advice from other local experienced fishermen, and understand the behavior of your target fish. The experts at FishingLicense.org encourage all fishermen to experiment with these smartphone apps so they can harness the power of technology on their next outing. Here are five of the best smartphone apps on the market today that cater to making your next fishing experience an exciting and successful one. For social fishermen looking to share and receive advice on their local waters, the Fishbrain app is the perfect one to start using. In real time, members of the Fishbrain app can share where the fish are biting and the dead zones to stay away from. The team at FishingLicense.org recommends this app for fishermen who are in a time crunch. If you only have a few hours in the water and are desperate for a catch, this app can cut out the journey filled with trial and error. Your local fishermen can point you in the right direction once you sign on, and you can try to help them out too by reporting your own fish activity experiences. There’s nothing better than a weather app that’s designed specifically for fishermen. This weather app is as accurate as possible, and includes up to the minute updates on clouds, wind and fog. 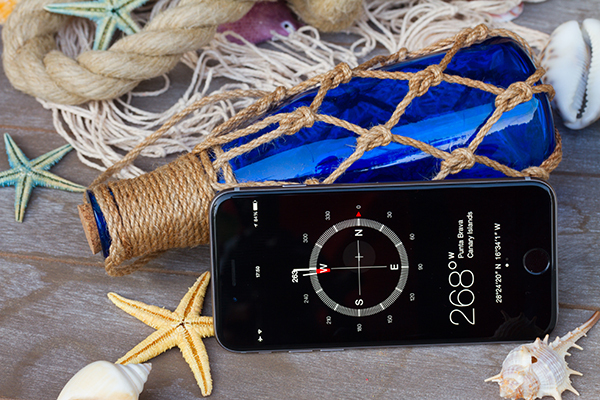 An app like Marine Weather by AccuWeather will tell you whether you should wait an extra 15 minutes before embarking on your fishing trip, which can be a matter of an easy exit from the dock or a complicated one. If you get stuck in a rain storm, knowing the exact end time of the bad weather will give you a better idea of whether you should head back in, or if it’s safer to wait it out. This is a different kind of smartphone app because it not only gives you weather updates, but also water conditions. You can pinpoint the exact area in the body of water you’re targeting and see in real-time the conditions you’ll be dealing with once you get there. According to the team at FishingLicense.org, once you download this app, it’ll be your go-to when checking conditions before you leave the house. This smartphone app will also allow you to plot coordinates on the screen and save your navigation outside of the app. At that point, it can be used without service, so you can look up the course you originally planned. When planning your day out to sea, or on the docks, the tides and weather are the most important things you should check. This NOAA app is perfect for fishermen because it covers the weather basics, but goes into details about water conditions and the tide. High tide hours can be great times to catch fish, making this app a priceless download for your smartphone. Fishermen who are analytical about water conditions can use this app to pick the exact hours they think their target fish will be most active. The IGFA smartphone app is a great resource for anglers. It’s a one-stop source for fishing rules and regulations in all bodies of water, throughout the world. If you’re planning a vacation or a trip to a body of water where you’re unsure of the legalities, checking this app can be a lifesaver. The experts at FishingLicense.org are fans of this app because it lays out the laws of catch and release and specific fish species clearly for fishermen who are new to the sport or who just need a brush up. More importantly, the app gives the world record on sizes of fish caught. If you think you caught a big one, use this app to see if you’ve broken a world record.